Scrambled pancakes is a great one when you feel like having pancakes but don’t feel like spending the time making individual pancakes. The taste is pretty much the same and this recipe is super quick! We love making this for breakfast. The coconut berry topping makes it really yummy and filling and depending on what berries you choose you can vary the whole dish! Crack the eggs in a bowl and beat with a whisk or spoon. Add the coconut oil (if it’s not liquid then just make smaller pieces of the chunk in the bowl), oats, flaxseeds, coconut flour and salt. Stir with a spoon into batter. Slice the banana into round pieces and add to the batter. Stir in your spices and optionals. Add some butter or coconut oil to a frying pan and put on medium heat. Pour the bowl of batter into the pan and push around every now and then with a spatula. Imagine you are making scrambled eggs. Meanwhile you make the topping by combining berries and some coconut cream into a bowl. Stir carefully with a spoon. 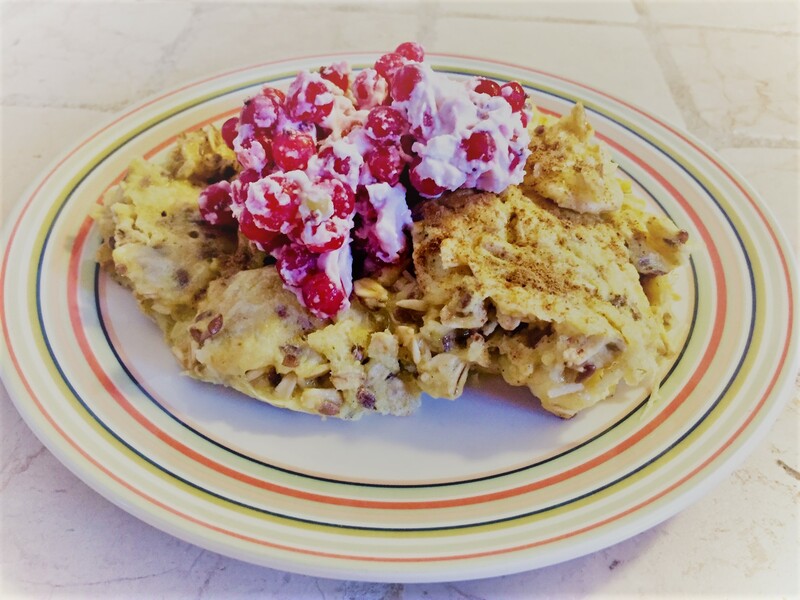 When the batter is cooked to your liking, add to two plates and serve your scrambled pancakes with some coconut berry topping. Enjoy!